This recipe makes a special cocktail-party bite when made with fancy Marcona almonds and Manchego cheese. Marcona almonds are imported from Spain; they are smaller, softer, and sweeter than regular almonds. 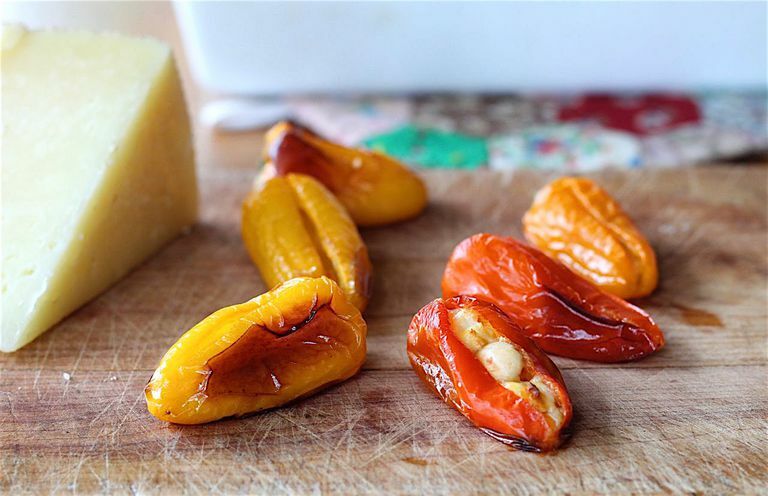 Paired with Manchego cheese, another Spanish treat, they are perfect for this recipe. Or, dress it down with pecans, peanuts, or regular almonds, together with feta, cheddar or Monterey jack cheese for an after-school snack. Either way, these poppers couldn't be easier, prettier, or tastier as a low-FODMAP treat. Preheat the oven to 400F. Oil a baking sheet. Spread the peppers out on the baking sheet. Allow them to settle naturally, so that the flattest side of each pepper is on the bottom. Using a paring knife, cut a slit in the top of each mini-pepper from the stem to the tip, then about 1/4-inch along the edge of the stem. Stuff each pepper with a large sliver of cheese and one almond; place it slit side up on the baking sheet. Roast the peppers on the middle rack of the oven until skins char on top and the peppers become tender, about 20 minutes. Cool until they are safe to pick up and eat, using the stems as handles; serve warm. Any type of cheese or nuts can be used instead of the Manchego and almonds. Mini-peppers are sold in cellophane bags in the produce section, which makes it easy to see the contents. Choose a bag with peppers of a small, uniform size, so they will all be done at about the same time. Pepper seeds are safe to eat, and you will probably barely notice them after roasting, particularly in small peppers. Larger peppers may have a few more seeds but they are easily removed. We use a mini melon baller, which has a sharp edge, for this task when necessary.